These armatures and maquettes illustrate the common working practices of traditional figurative sculptors like Fredericks. He fashioned the armatures from flexible wire and sheet metal to support the clay he would then model over those forms. The maquettes are small studies for larger works. 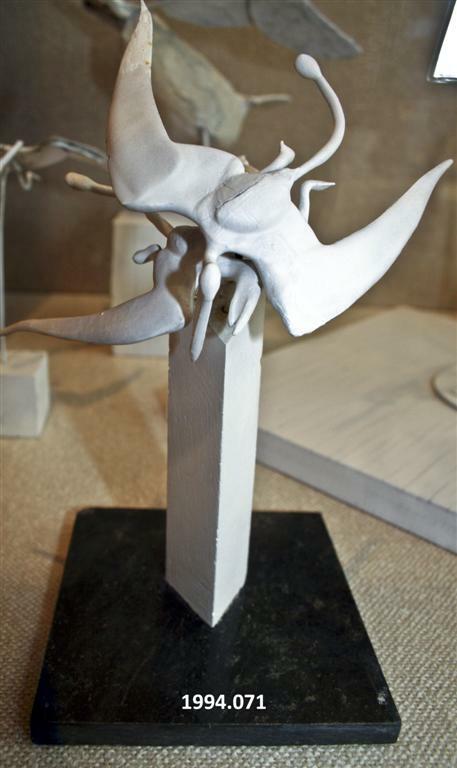 He modeled the two pterodactyl maquettes directly in wet plaster rather than using clay. Typically, the next step would be to create larger sketches, studies, scale and/or full size models in clay, then to make molds to cast the models in plaster. Finally he would use those plaster models as patterns for stone carving or to make molds for casts in bronze or aluminum. 7.625" x 5.5" x 4.25"
Fredericks, Marshall M., 1908-1998, “Flying Pterodactyls, Maquette, [Plaster and Metal],” Marshall M. Fredericks Sculpture Museum, accessed April 20, 2019, http://omeka.svsu.edu/items/show/5248.